Dimensions (HxWxD): 4.33" x 1.8" x 1.4"
This amazing totally untreated, partially polished Madagascar Smoky and Clear Enhydro Scepter measures 4.33" high by 1.8" wide by 1.4" deep and weighs 7.45 ounces, just slightly less than half of a pound! At Tucson in 2011 the only exciting new finds were from Madagascar and this particular formation was quite unique. This large Smoky Enhydrous Scepter from Madagascar radiates a soothing, grounding energy that unites us with the flowing seasonal transformations that create the ever-changing kaleidoscopic web of life on Mother Earth. As we allow ourselves to let go of the separate self, we relax our minds, and open our hearts. That's how healing begins. This flawless scepter has absolutely no dings or imperfections on the termination tip, which contains a large channel containing water purified by hundreds of thousands of years of geological time, and intense heat and pressure, and the "channel" contains an extremely large air bubble. The shaft sits on a small amount of matrix, adding to the mineralogical value of this unique specimen. Look deep inside the tip and view a Zen landscape complete with swirling gossamer clouds, rainbow inclusions and brilliant white accreted stair-step inclusions against the back of the crystal. The word enhydrous comes from the Greek and means "having water within". The American Geological Institute’s Glossary of Geological Terms uses the term "enhydro" strictly to refer to "a hollow nodule or geode of chalcedony containing water, sometimes in large amounts". Most rockhounds refer to any crystal containing a pocket of water as an "enhydro" and we prefer the common usage to technical terminology so we refer to water-containing crystals as enhydros. Enydros often contain bubbles of air trapped in the pockets of water within the crystal, and so they are also sometimes called "water bubble quartz". Water bubble quartz enhydros were formed by some estimates as much as 220-400 million years ago. The edges of the quartz formation crystallized faster than the inner regions, forming troughs that trapped water and other material. As the inner troughs cooled, and were covered by yet more layers of crystal growth, the trapped liquid would cool and contract, forming air bubbles within the crystal. By the logic of their formation, enhydrous water bubble quartz usually contains more inclusions than other types of crystals, so you won't find stunning clarity in a water bubble quartz crystal. That would be against their nature. These rare crystals have some unique metaphysical properties that lightworkers, meditators, and spiritual seekers will appreciate. Water is associated with the emotions, and the emotions are associated with the emotional body, often called the astral body, which is the home of our dreams, ancestral spirits and past-life imprints. Enhydrous quartz contains water that has retained its purity over countless millennia and been continuously charged and cleansed by the surrounding quartz crystal formation, so that water represents emotions that have undergone a most rigorous and thorough purification. Thus enhydrous crystals can be used to purify the emotions, to encourage the smooth flow of emotional life, to remove emotional blockages, and to facilitate the release of emotional blockages caused by traumas in this and previous lifetimes. The presence of the purified water within the crystal adds to this stone's power to protect the user and purify the stone's environment of all negative emotions by transforming negative energies into more positive frequencies. Scepter crystals were traditionally used by shamanic practitioners, high priests and high priestesses in various cultures around the world for healing and to connect to Higher Worlds. 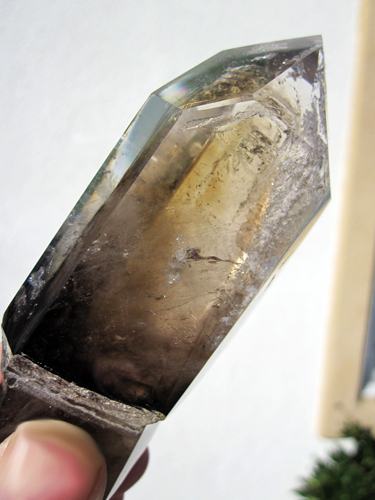 They are considered by lightworkers to be powerful amplifers of energy, which can transmit as much energy as other quartz crystals many times their size. 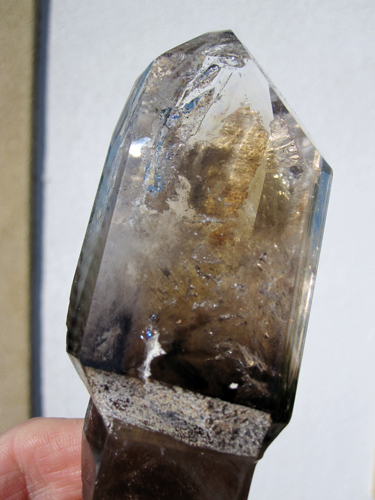 Smoky quartz is one of the most energetically powerful and mineralogically mysterious of all quartz crystals, often undervalued since this form of quartz is not flashy, transparent or glittering to the eye. 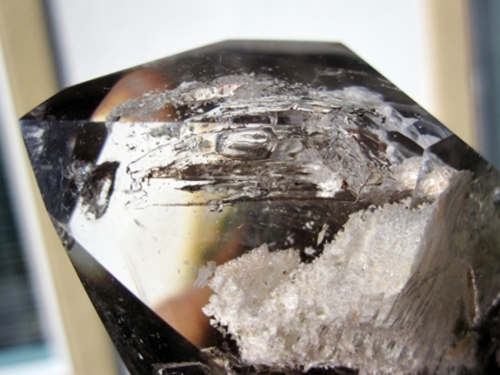 We know you will use this powerful crystal with loving wisdom and respect its long journey in the Earth that has lasted for many long historical cycles. Accepting this crystal into your life is a responsibility as well as a delight. This crystal is not a toy, but rather a powerful tool, a love-gift from the Divine Mother, and should be treated with the utmost respect and appreciation. Note: Above weight is shipping weight. Net Weight is 7.45 oz.